Larry Henderson joined the police in 1971 as a civilian Scenes of Crime Officer (SOCO). He retired in 1994 due to injury, aged just 49. At the time of his retirement, he was considered the most experienced SOCO in the country, having worked with just about every police department in every field, from terrorism to armed robbery and from blackmail to murder, and was at that time the head of The Flying Squad’s forensic team. Larry is married to Jennifer and they have two sons. 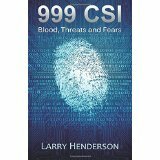 Larry Henderson’s 999 CSI is continuing to generate media interest, with this latest piece in the Gazette. 999 CSI, the sensational new police memoir from Larry Henderson, is continuing to generate media interest after serialisation in the Daily Mail. The sensational new police memoir 999 CSI by Larry Henderson was serialised this week in the Daily Mail. The book has just been published by the agency’s imprint Thistle Books.